Evergreen shrub. Slow growth. Lush, glossy, but small dark green leaves. 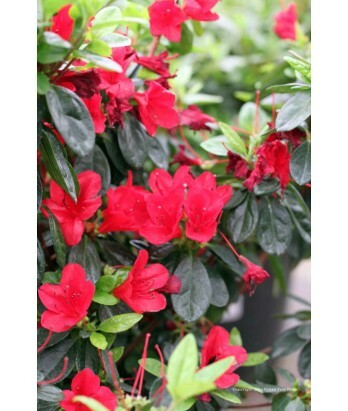 Sumptuous deep red flowers have a darker zone at the base of their upper lobes. Solid rose flowers also occur. Blooms in spring. Regular water needs in well-drained soil once established.